Check your chotchke shelf–you might have a piece of Madison’s history sitting there. In February the East Side History Club learned about two ceramic artists who worked in Madison in the middle of the last century. Ann Waidelich drew out the comparisons and contrasts between the two in her informative program. 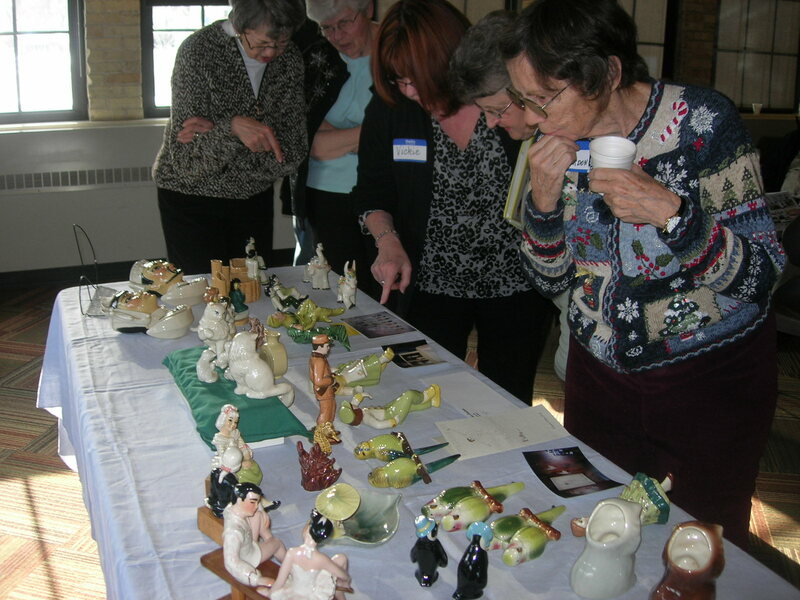 Special guest Mary Lamm Feltman of Rockford, president of the Ceramic Arts Studio Collectors, heard about our meeting and traveled to Madison to attend, along with several members of her group. 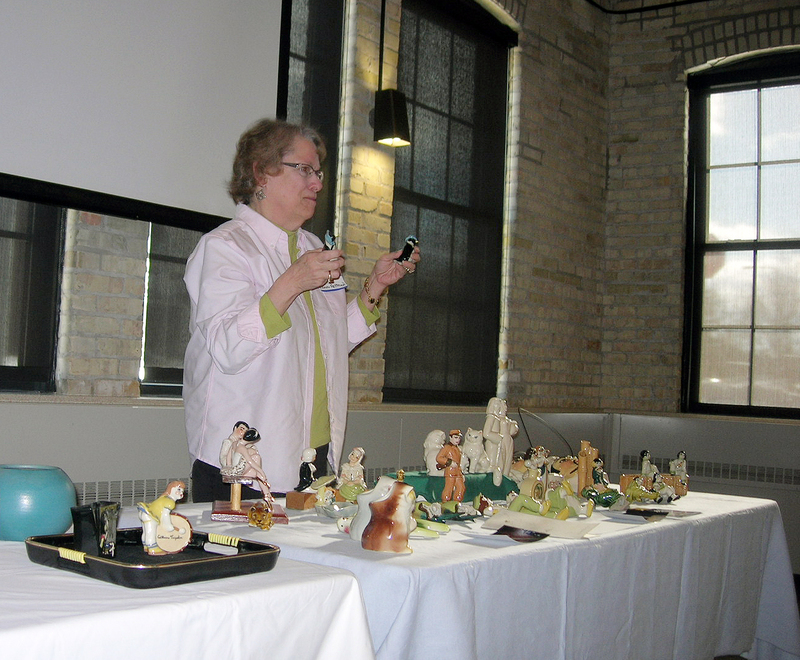 Mary Lamm Feltman shares tips for identifying true Ceramic Arts Studio figurines. 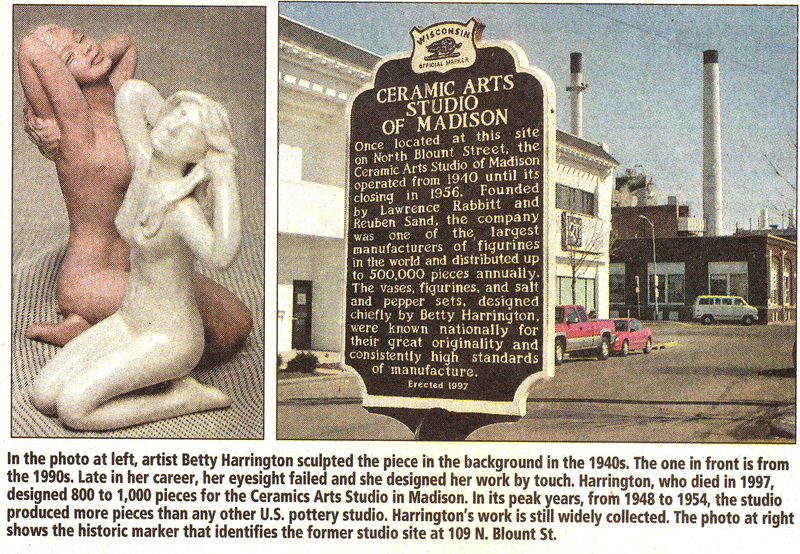 Ceramic Arts Studio founder Betty Harrington lived on Waubesa Street near Madison Brass Works. 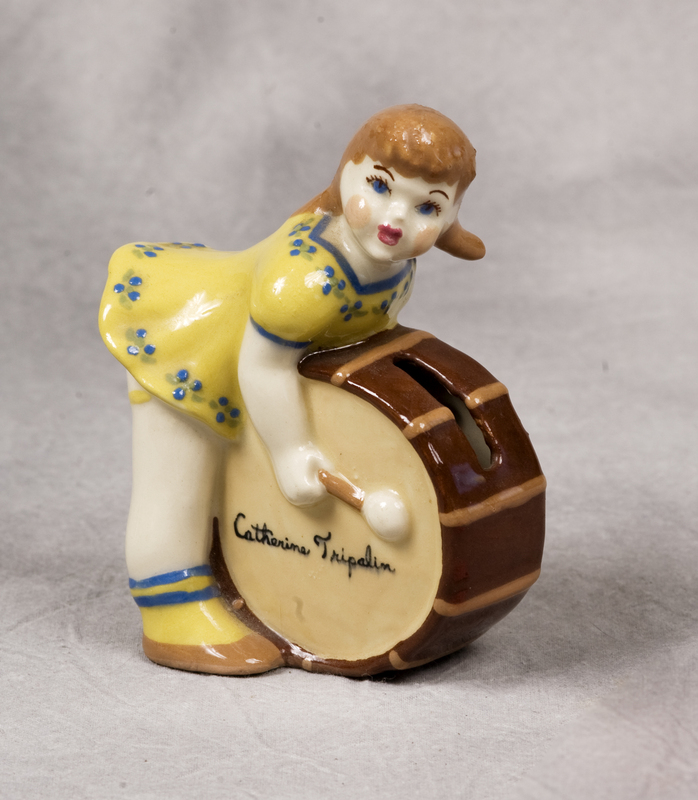 Kathy Seifert, whose grandfather Edward Schwenn founded Madison Brass Works with Henry Vogts in 1909, grew up nearby and played in Harrington’s back yard, occasionally receiving figurine “seconds” as gifts. 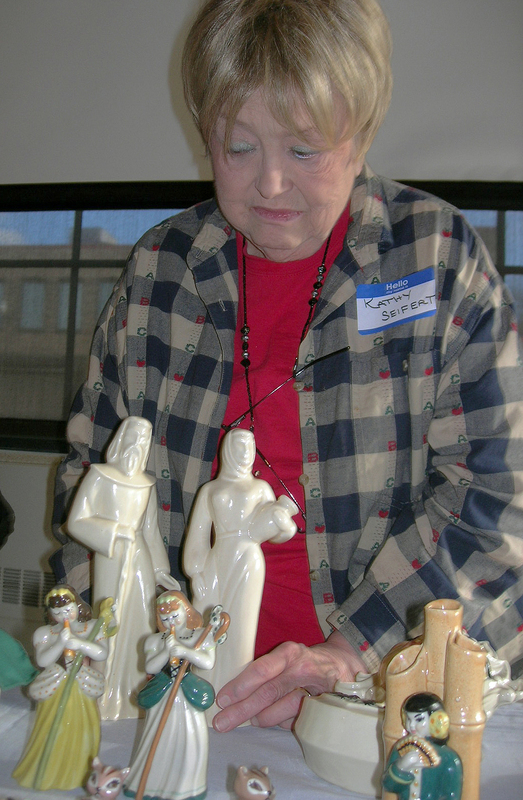 Kathy Siefert displays her Ceramic Arts Studio figurines known as “Rebecca and Isaac”. 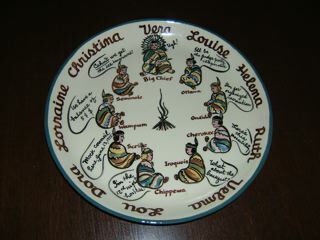 Century House plate is from the collection of Ann Waidelich. 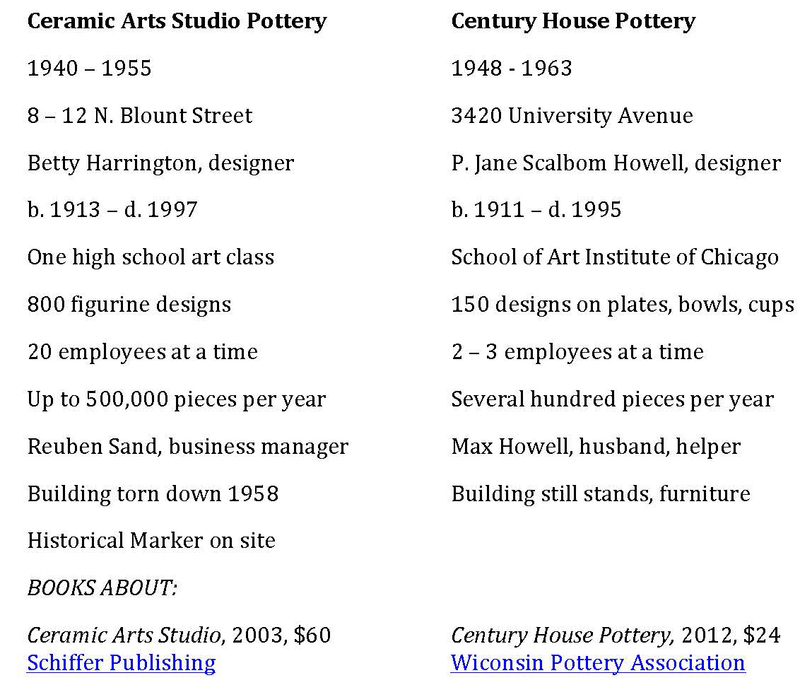 In the middle of the last century, Madison boasted two commercial potteries: Madison Ceramic Arts Studio and Century House Pottery. Ann Waidelich will speak about their history and connections to Madison’s East Side. Bring your local pottery paraphernalia for show and tell! If you are on the East Side History Club’s postal mailing list, look for your meeting announcement to come in a new cost-saving postcard format.